One of our neighbors is retired and, so far as we can tell, spends approximately twelve hours per day golfing. Golfing from his front lawn, that is. While he’s an agreeable fellow and we will not begin to question the motives or reason of someone that has this compulsion, we will simply observe that our neighborhood has an infestation of foam practice golf balls. Beyond the many hundreds of balls that are successfully reclaimed each day, some dozens accumulate in the yards, bushes and hanging potted plants of our house and the houses of our other neighbors. They get stuck in the trees and bushes, confusing us when we go to pick lemons. People remember to shut the windows of their cars when they park. Sometimes it gets so bad they clog the gutters. You can even find them in places that they could have only gotten to after three reflections, leaving you quite puzzled. But, you get the idea. Once behind a fence, they seem to have particular trouble getting out. (Especially if there’s a dog.) Case in point: This weekend we were at one of our (non-golfing) neighbors houses for a birthday barbecue. 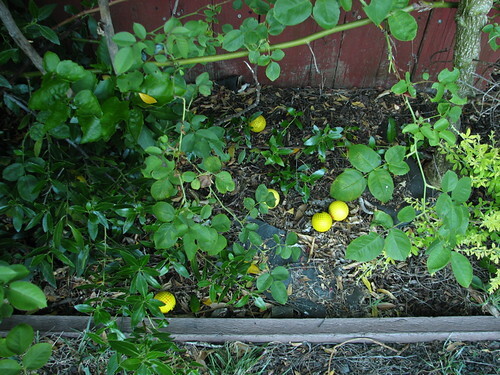 In the back yard, down below the little bushes, approximately twenty yellow balls were visible. I didn’t look hard; these were just the ones in plain view. When I pointed them out to our hosts, I learned that they had already thrown the day’s catch (a few dozen balls) back over the fence. What do do? We decided to practice a humane method of dealing with pests: catch, tag and release. Many of the partygoers got involved in the process. Most of the balls were tagged with simple designs, but some were quite elaborate. We particularly liked this set (which we didn’t make), showing four foam balls as members of Kiss. We tossed them over the fence, and they disappeared early in the morning. We’re waiting to see if any of the tagged ones reinfest the yard, or if we get new ones every day. If our golfing neighbor is sufficiently annoyed by people writing on his little foam balls, it may even be effective as a means of population control. This entry was posted in Art, Everything Else and tagged art, golfing, humor. Bookmark the Permalink. thats hilarious! good idea. let us know of any updates! Next time you see him, punch him in the nuts for me. Why don’t they sell the balls already tagged for the golfers? Besides musicians, one could have other celebrity faces, logos, or Bible verses. I know, it’s probably against the rules. I am new to this forum and i like to introduce me. My name is lavonee and i have found something about your topic in this site. So, I would like to share you. Please respond me just you thing this is helpful for you. Are they the same weight of a normal golf ball? Maybe some of those compressed talc "exploding" golf balls should find their way into the population. 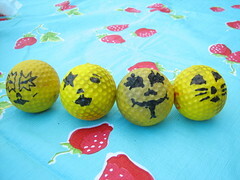 I wonder what a 3D candy golf ball would look like when hit by a 5-Iron. Unfortunately, they are mostly foam rubber balls. A few of them are more like ping pong balls, but the foam ones must be preferred because they usually survive being run over by the cars in the street. So, there’s very little hope of substituting one of the standard-issue exploding balls. It certainly might be possible to hack one of the foam balls, however– cut it in two and fill the inside with something a little less dangerous than nitroglycerin. Or maybe just inject it. Chalk dust, like in the standard exploding balls, would be pretty easy to do as well. That is an absolutely brilliant idea! We’ll have to give it some thought…. No pacman golf ball? They’re already yellow.